Dial The Sun | JONAH BRUCKER-COHEN, PH.D. 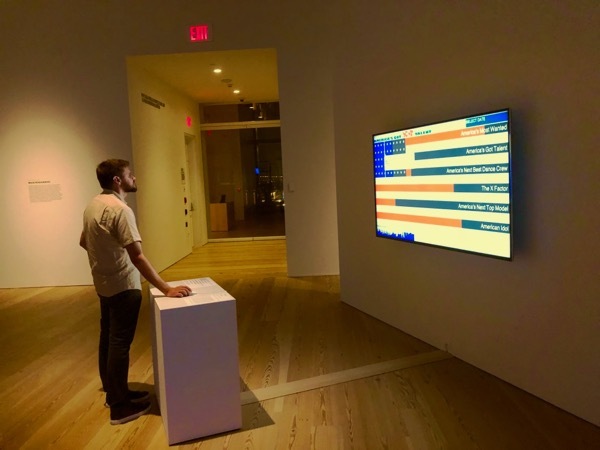 Dial The Sun – JONAH BRUCKER-COHEN, PH.D.
Texas based artist, Max Kazemzadeh’s “Sun.Dial” project is a “an internet-based installation project that fosters a sense of shared global space and time. The principle system consists of twelve LCD displays suspended from an overhead apparatus in an outward-facing ring. This circular display is the hub of a world-wide input system. Each screen displays the information from one of twelve webcams located at intervals around the world. Each camera faces upward, capturing only the sky in each location. This creates a light gradient ring that displays the current state of the skyâ€™s light at points around the globe. When it is dawn in one screen, it is noon a few steps over, and nightfall a few steps down from that. A connection is created between the hosting site, where sun.dial is located, and the locations capturing the light of the sun. The piece is in a way a digital incarnation of the astrolabes and orreries that were the beginnings of technologyâ€™s global perspective…” Looks cool – haven’t seen it in person yet, but I like the idea of using networked, web-cam images as a unified real-time display clock. I always wonder how reliable web cam-based project are however. i guess it works OK for wolfgang tho. great idea tho. and dig the sculptural component as well.